Islamic Relief Pakistan New Internship 2019. Islamic Relief will select Multiple peoples from all over Pakistan. The Duration of the Internship will be 6 Months.Monthly Stipend Rs 20,000 PKR. MBA, Masters, Finance, M.com, MBA HR, Social Sciences & others. 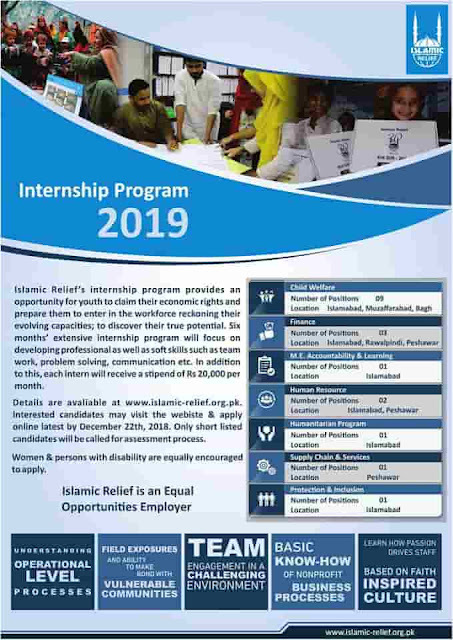 How to Apply for Islamic Relief Pakistan Internship 2019? 1) Create an Account & Register Yourself. 2) Click on Current Jobs. 3) You will Find All Internships. The last date is 22nd Dec 2018.